Keisuke Musashino, a native of Chiba, Japan, has taught Japanese immersion classes at Mt. Tabor Middle School in Portland since 1998. 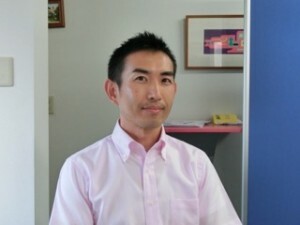 Prior to finding his place in Portland, Keisuke spent a year in Tennessee as a student on a study abroad program and three years in Georgia as a student. Having been a duck since last June, he enjoys everything the “tracktown” offers and spending time in the library. Why did you choose to come to the LTS program? The short answer is that I felt that I needed to study more about teaching language. Here is a longer version: when I was invited to be an intern at Mt. Tabor in 1997, I had no training in teaching the Japanese language. A short teacher training course over the summer before starting my internship and the internship experience itself really got my feet wet for teaching, and it did not take much time for me to realize the different culture of teaching and learning in the US, and complexity of teaching Japanese to middle school immersion students. Furthermore, being a classroom teacher at a public school gives you a whole lot of responsibility in and outside of classroom. So, I learned many things the hard way. At my school, my colleague and I worked for several years to create a curriculum for each grade level emphasizing both Social Studies content and Japanese language. My responsibility is teaching the language (including grammar), mostly through thematic units. Without extensive knowledge about the Japanese language and how to teach it, I have basically taught myself how to do it using whatever resources available. That ignited my desire to go back to school, so I decided to take a leave of absence for a year. As I started looking for institutions, I thought about the U of O based on the location and knowing that they take a leadership role in teaching languages with CASLS. Then I ran into the LTS website and was really intrigued with what the program would offer. After communicating with Keli by e-mail, I was convinced that the LTS program would give me the best learning opportunity. Plus, I could get to live in Eugene for a year! So, it was an easy choice for me. What advice would you give to other experienced teachers who are interested in the LTS program? There are so many good things about this program. First of all, I think this is a rare program that has a really good balance between theory and practice, and even teachers with years of experience will be able to learn a lot from each class the program offers. In addition to the core classes such as lesson planning, curriculum design and assessment design, students can also take some elective classes based on their needs. For example, I took classes about discipline management, Japanese pedagogical grammar and another pedagogy class specifically for East Asian languages. They are all important for me as a teacher who teaches middle school Japanese immersion classes. Also, if you have teaching experience, you can really reflect on your past teaching practices with what you learned in class and share your experience with your classmates who are just entering the profession. Also, I should note that the program can be completed in five terms (starting in the summer term and ending in the summer term in the following year) – that was another reason why I chose the program. I felt I could get the most out of my year-long study leave. Oh, one more thing – this is a wonderful learning community with caring professors and energetic/fun classmates! I feel I am fortunate to be able to get to know them, study with them, socialize with them and run with them (please see the post about LTSEOTT – LTS Eye of the Tiger – on this blog!). I would honestly say my passion for teaching is even stronger now. What is your MA project on? The student body in the Japanese immersion program has become more linguistically diverse, and the class size has also become larger (typical for public schools, I guess). Besides, teaching middle school students is sometimes challenging. They are somewhere between children and adults, are usually honest, but very self-conscious, and have different interests and learning styles. With all those elements, I struggled with reaching all the students last year and keeping them motivated. That experience inspired me to investigate challenges specifically in the middle school immersion context, L2 identity, motivation and differentiated instruction. Based on the findings, I would like to create examples of teaching materials for my class that I can use when I go back to my school after finishing the program. What are you most looking forward to in your remaining time in the program? I cannot believe there is only one term left. While I really enjoyed all the classes I took in the last four terms and the experience of working with students in the second-year Japanese students as a GTF for the Fall and Winter term, I am most definitely excited about giving my full attention to my final project this summer. Also, as I only have a week until I go back to my school after graduating in August, I look forward to enjoying the summer weather in Eugene, being outside whenever I can, hanging out with my wonderful classmates and just having fun. Wonderful Keisuke!!! You are amazing and I’m glad I came to know you and hang out with you! ??? I can not wait for your return to Mt Tabor so you can share more about this unique program. I feel your enthusiasm, your old students, new ones and ME are so lucky to have you back! !